With a new school year there is always a reason to change things up a bit in lessons and doing so in my Interactive Notebooks is no different. Back in September 2012, I created one of my first flippables for my official interactive notebooks and that has widely been seen around the internet. 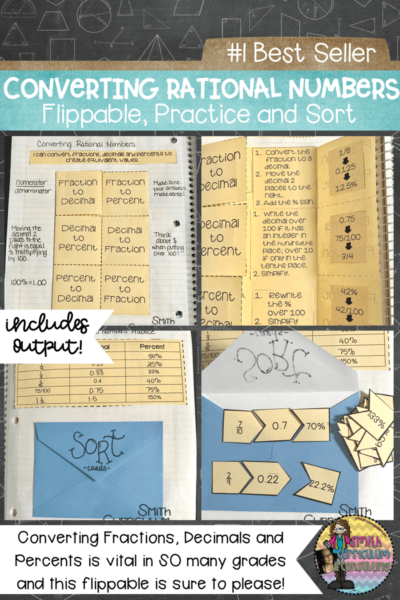 This Converting Rational Numbers flippable is my best seller on Teachers Pay Teachers individually with over 8,600 of these sold! Seriously this BLOWS my mind and I’m so very thankful for each of you. 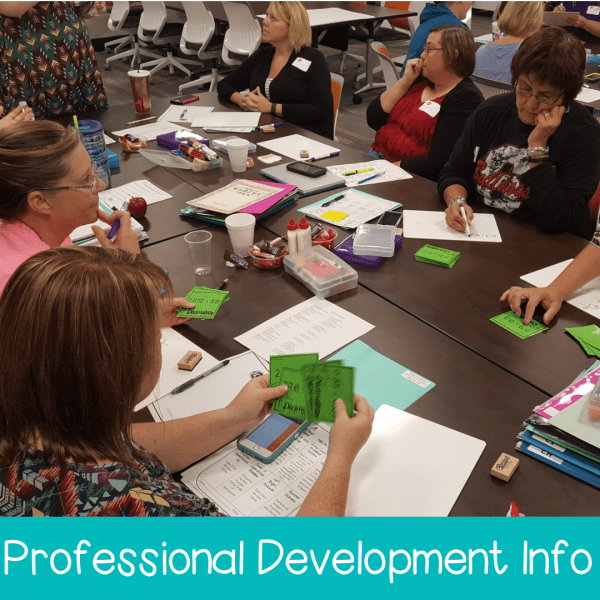 Now, not only has it now been updated with a total of SIX different versions for teachers (and students) to use, but it also includes a follow up output activity for ease of use in the classroom as well as an Exit Ticket. So, if you own this, go redownload it and get all the new goodies so you won’t miss out! I have always done a form of conversion practice for this interactive notebook lesson but I never had a formal one included in with this until now. I have included a short and simple practice table that students can easily practice converting between fractions, decimals and percents. And, because sometimes that isn’t enough, I have also added a quick and easy puzzle sort for students. All they have to do is cut the pieces apart (or they could already be cut apart) and then form the puzzles that match the conversions of each number. When they are done, have them store them in an envelope for safe keeping and it allows easy practice at a later time. 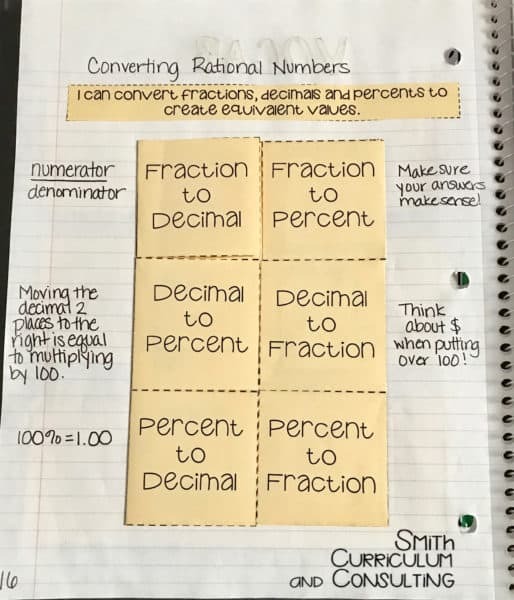 While the topic of converting rational numbers spans many different grade levels, it is a skill that must continually be practiced to build understanding and automaticity in the conversions. 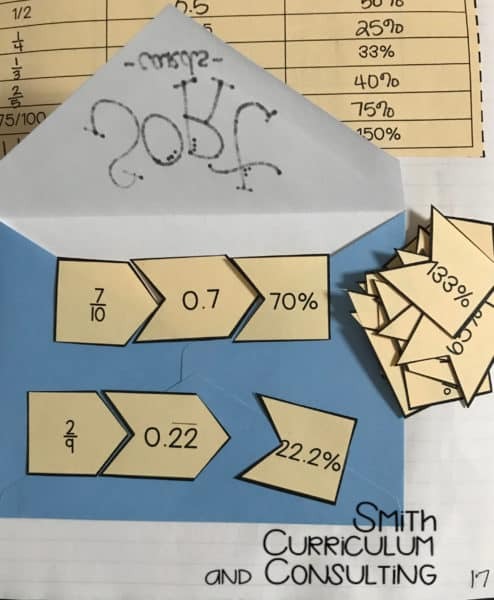 The puzzle that is now included in the output of this lesson will truly help with this skill and not only for the numbers included but those that are doubles and halves of those numbers as well. You could totally extend the lesson for students to find those at a later time as well! I hope that you enjoy these updates! I truly hope that they are beneficial with your students. Do you still sell Spiral Bound INB Teacher Edition? I’d like to purchase one. Thank you for your purchase! Glad we were able to connect. I was trying to get the password to see your freebies. My information was not accepted. 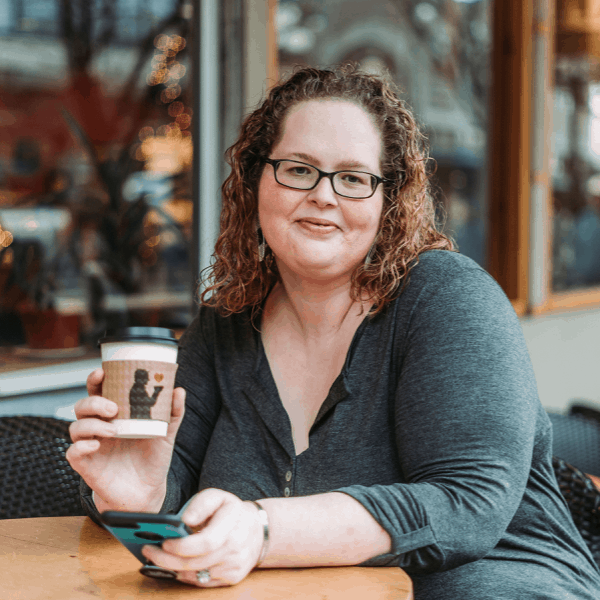 Are you a member of my newsletter list? All members of my newsletter list receive the email with the password once they have signed up. You can sign up right here and jump right on in!